Speaking to the media this weekend ahead of a meeting with German Chancellor Angela Merkel in Germany, Putin said Europe and Russia “need to strengthen the humanitarian effort in the Syrian conflict. Earlier this month, a Russian suggestion that the United States and Russia form a joint group to finance infrastructure renovation in Syria was met with an icy reception, according to a US memo seen by Reuters. “That’s why we have to do everything to get these people back home,” he added, emphasizing the need to properly restore basic services such as water supplies and health care. The conflict in Syria—caused directly by US, EU, Israeli and Saudi intervention in that country—all in an attempt to depose its elected leader, Basheer al-Asaad, has killed about half a million people, driven about 5.6 million out and displaced a further 6.6 million within it. * Earlier last week, Putin made no secret of which side of the political fence he stands in Europe with regards to the fake refugee invasion of Europe when he personally attended the wedding of Austria’s Freedom Party’s foreign minister Karin Kneissl in Austria. Putin, who brought a Cossack band with him to join in the celebrations, was seen dancing with Kneissl and enjoying the company of senior Austrian FPÖ politicians, including party leader HC Strache. The conflict in Syria had multiple objectives. The first was to oust Assad, Iran’s closest ally in the region, using dupes in ISIS, financed by the Saudis and armed and equipped by the West. The ousting of Assad would have then been used to bring regime change to Iran. Nor is it an accident that the refugees created by the conflict headed to Europe. They were enticed there by George Sorso who financed the printing of handbooks to guide them to the heart of western Europe. While for her part, Angela Merkel effectively opened Germany’s borders and invited all and sundry to come. None of this happened by coincidence. The conflict in Syria and the refugee crisis that ensued were both part of the same dark design. The objectives were manifold: to oust Assad, to bring regime change to Iran and in the process to use the ensuing refugee crisis to transform Europe’s identity. Russia’s intervention in Syria put a stop to attempts to oust Assad. However, attempts to bring regime change to Iran and transform Europe’s demographic identity are still ongoing. Both are still in the balance so it’s no surprise to find that some already see Merkel’s implicit rejection of Putin’s offer. Merkel has been tasked with destroying Europe’s ethnic and cultural identity. To rebuild Syria would disrupt that plan as many of the refugees who’ve taken refuge in Europe would naturally return home. So unsuprisingly, the woman who was instrumental in creating the migrant crisis doesn’t seem ready to take up Putin’s offer. Ed. 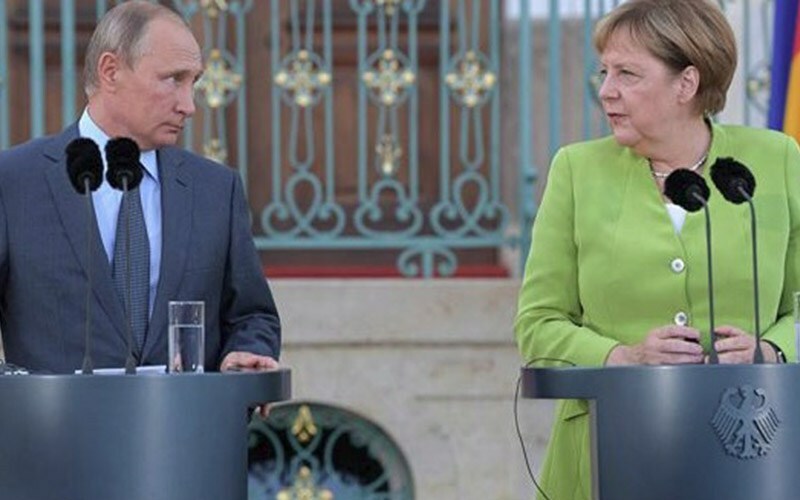 German Chancellor Angela Merkel seems to have rejected Russian President Vladimir Putin’s call to financially contribute to the Syria reconstruction. Speaking after talks with Putin outside Berlin on Saturday, Merkel said the focus should rather be on averting a Syrian army operation to retake the militant-held province of Idlib. Her retort came after the Russian leader underlined the need for assistance to rebuild Syria and ensure that refugees could safely return to their homeland. The Russian president also put the number of refugees in Turkey at three million while Jordan and Lebanon each host one million refugees. Putin emphasized that Syria’s basic services such as water supplies and healthcare should be properly restored. The German chancellor, however, showed reluctance to financially engage in the Syria reconstruction process and stressed that the priority in Syria was “to avoid a humanitarian catastrophe,” particularly in Idlib. Germany is a member of the US-led coalition which has been bombarding Syria since September 2014 without any authorization from the Damascus government or a UN mandate. The aerial assaults have killed many civilians and destroyed Syria’s infrastructure.